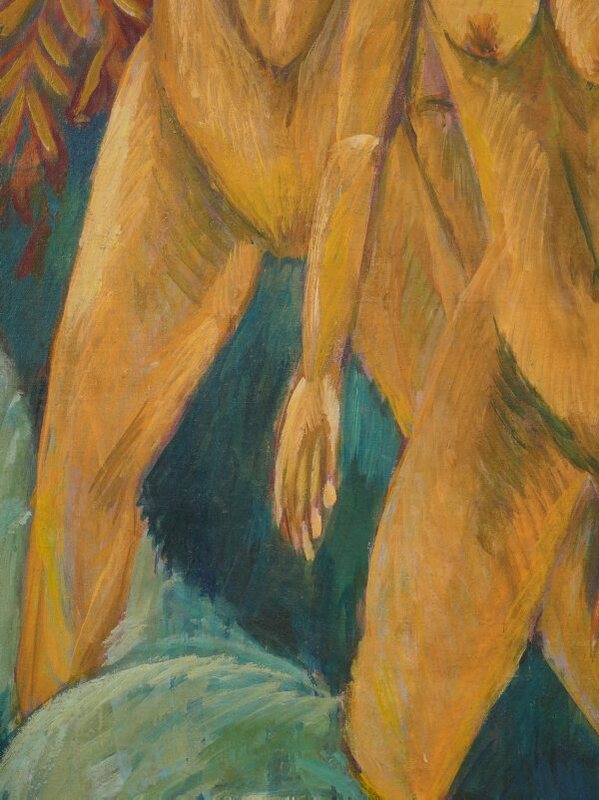 As one of the founding artists of 'Die Brücke' group in 1905, Kirchner is essential to the history of German expressionism, a movement he virtually personifies. 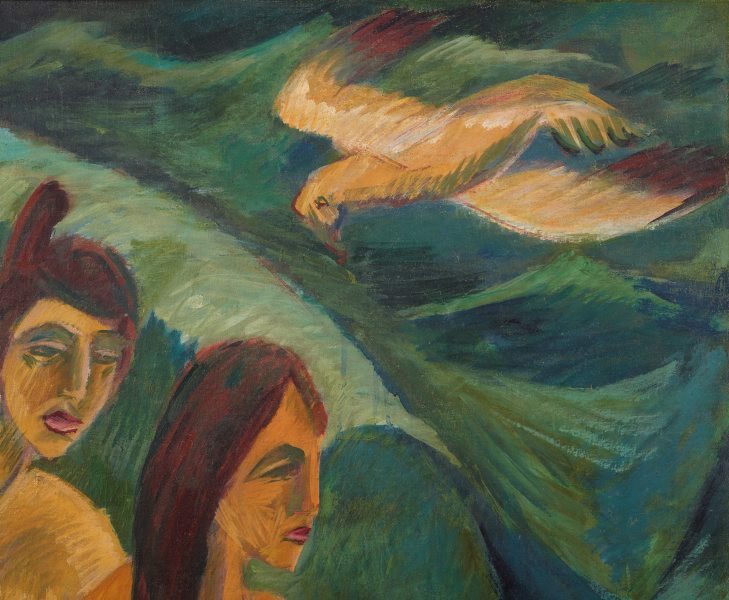 Trained in Munich and Dresden, he was attracted to neo-impressionism, van Gogh and tribal artefacts, combining influences from all three in his searingly emotional paintings, drawings and prints. His woodcuts and woodcarvings combine traditional German folk forms with more primitive instincts. His oil paintings, ranging from ambitiously large to intimate in scale, equally show the effects of ethnographic research. 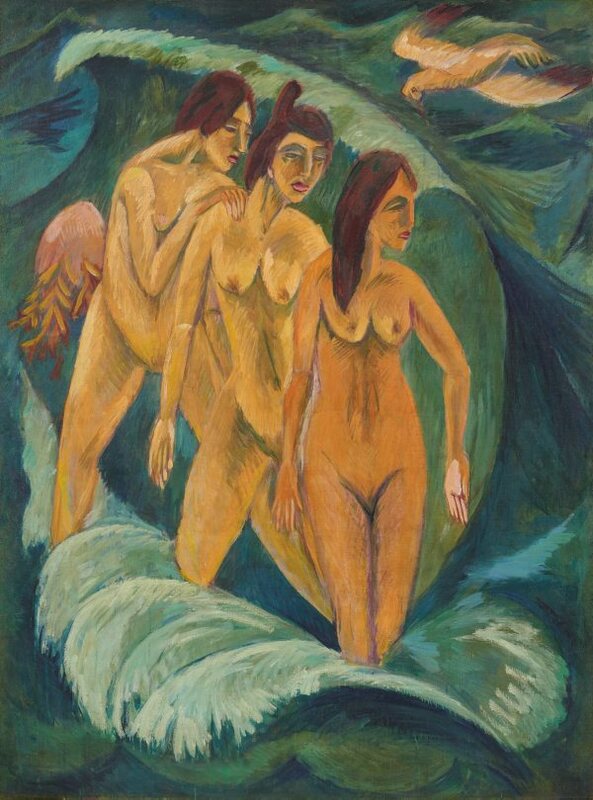 The nudes in 'Three bathers' resemble the artist's painted carvings, echoing in turn the sculpted Eves of medieval art as well as African and Pacific statuary. Wearing lipstick and a look of enervation, these Berlin day-trippers huddle defensively in the Baltic waves. Uncannily presaging the coming blitzkrieg, the figures also predict the artist's own deteriorating health. 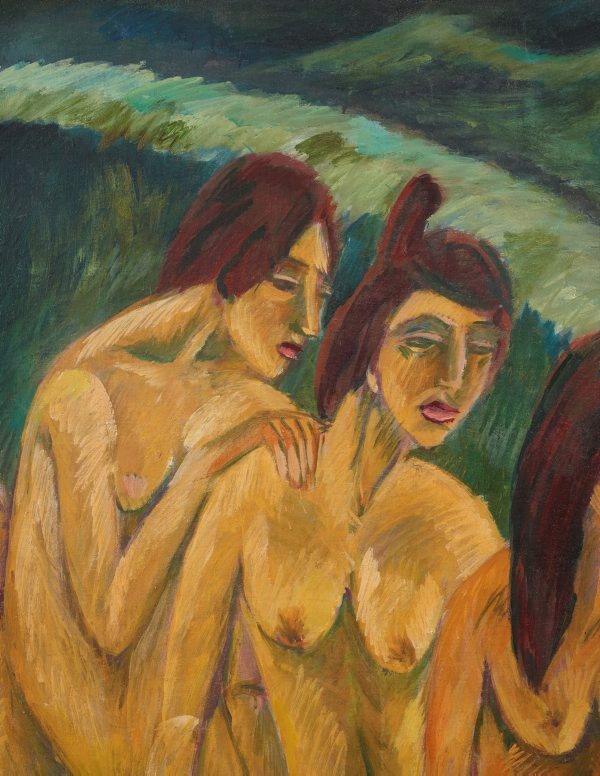 Conscripted in 1915, Kirchner was discharged six months later with tuberculosis. Kunstsammlungen der Stadt Düsseldorf, 27 Mar 1928-26 Aug 1937, Düsseldorf/Germany, Gift of Paul Multhaupt 27 March 1928. 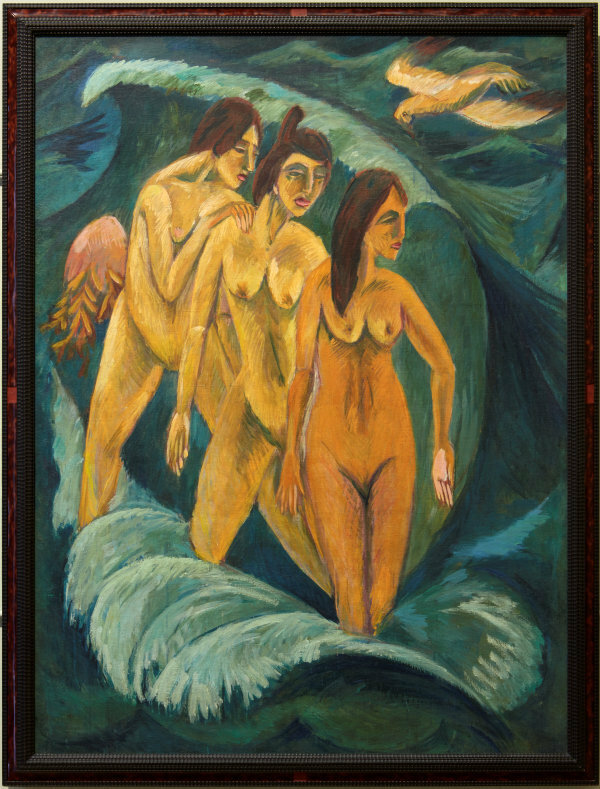 Confiscated by the German Reich as "Degenerate Art" from the Kunstsammlungen der Stadt Düsseldorf on 26 August 1937. Number 2046 on the National Socialist inventory, label verso. Not exhibited in the "Degenerate Art" exhibition. Stored at Schönhausen Palace, Berlin (storage of "useable" works of art) from August 1938 until 8 December 1939. Purchased by Karl Buchholz, 8 December 1939. 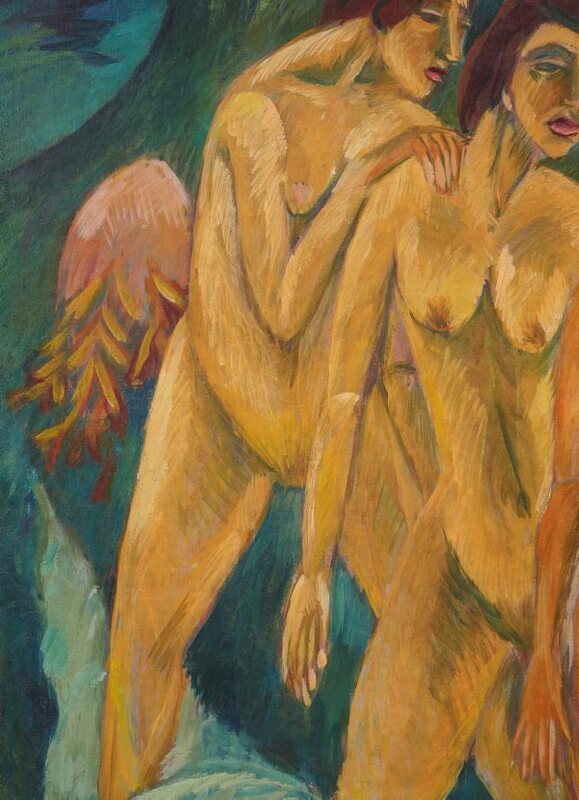 Buchholz Gallery Curt Valentin, 08 Dec 1939-1951, New York/New York/United States of America, Berlin dealer Karl Buchholz, was one of the four main art dealers granted permission by the German Reich to sell confiscated works of "Degenerate Art" on the international art market. 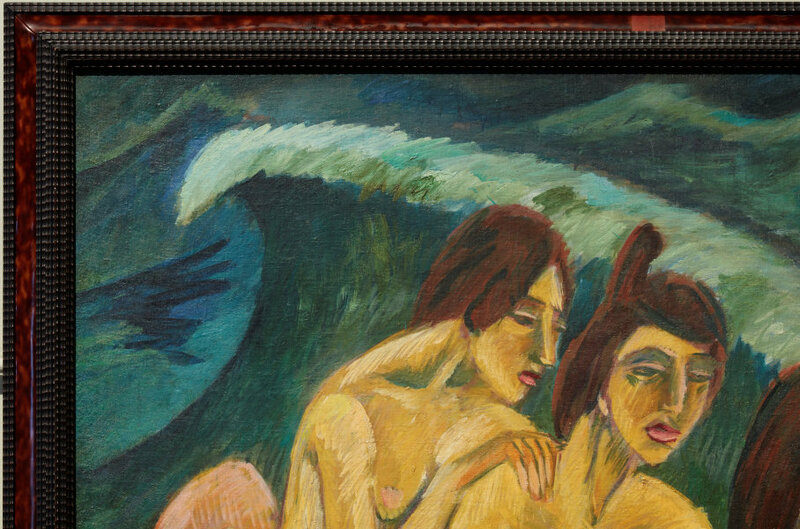 In 1940 the painting was shipped to Buchholz’s New York gallery, run by Curt Valentin, inventory no. NY1957. In 1951 the gallery was renamed the Curt Valentin Gallery. Curt Valentin Gallery, 1951-Jun 1955, New York/New York/United States of America, Purchased by Mr and Mrs Zimmermann, June 1955 from the 'Closing exhibition. Sculpture, paintings and drawings'. Mr & Mrs Frederick Zimmermann, Jun 1955-circa 1969, New York/New York/United States of America, Frederick Zimmermann (USA 1906-67). 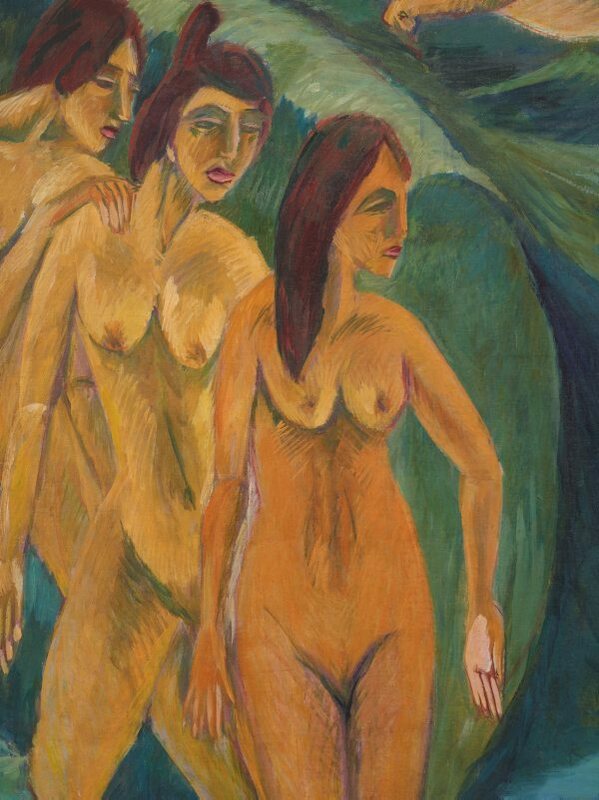 Loaned by Mrs Dorothy Zimmermann to 'Ernst Ludwig Kirchner: a retrospective exhibition' at the Museum of Fine Arts, Boston, 20 March - 27 April 1969. Touring exhibition, exhibited in Boston only. Renée Free, AGNSW Collections , 'The Western Heritage, Renaissance to Twentieth Century', pg. 108-172, Sydney, 1994, 148, 149 (colour illus.). Renée Free, Art Gallery of New South Wales handbook , 'European', pg. 36-56, Sydney, 1988, 52, 53 (colour illus.). Bruce James, Art Gallery of New South Wales handbook , 'Western Collection: Paintings and Sculpture', pg. 17-77, Sydney, 1999, 55 (colour illus.). Elwyn Lynn, The Weekend Australian , 'Nature versus humanity', Sydney, 01 Sep 1984-02 Sep 1984. Michael Wardell, Look , 'Foundation building', pg.14-17, Sydney, Sep 2004, 14 (colour illus.). Vibrant Metropolis / Idyllic Nature. Kirchner - The Berlin Years , Munich, 2017, (colour illus.). Portrait of a Gallery , 'The Foundation', pg. 12-13, Sydney, 1984, 12, 13 (colour illus.). 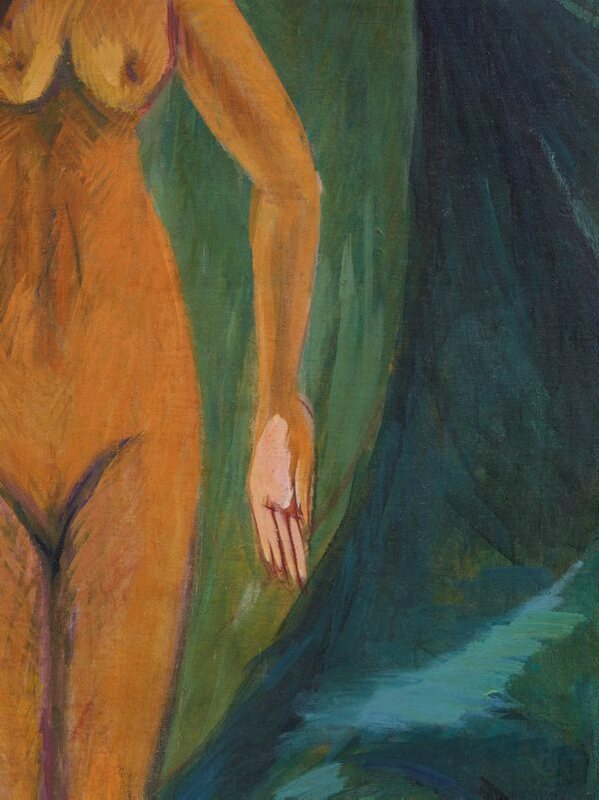 Art investigator , 'New Visions' - German Expressionism: Die Brücke', pg. 178-79, Melbourne, 1998, 179 (colour illus.). Art Gallery of New South Wales Foundation Annual Report 1997 , Sydney, 1997, 11 (colour illus. ).